This menu is part of the page "Moonlight Fairy" on "www.AvalonsTreasury.com". According to old belief the moonlight fairy instructs in finding the right decisions. Wearing this pendant expresses an interest in the magic nature of the fairy realm and its inhabitants who are a symbol for happiness, fun and the pleasure of being alive: Fairies are well known in many different cultures and are playing a major role in their myths. In a lot of these legends it is told that fairies have the skill to let people only see what they are supposed to see and to put on the shape of which people are thinking they should have. According to old belief the moonlight fairy instructs us how to find the right decisions thereby reaching prosperity and joy in life. This fairy is believed to be an especially wise being from the fairy realm - she is said to support her wearer by donating knowledge thus boosting the inner serenity of his thoughts. 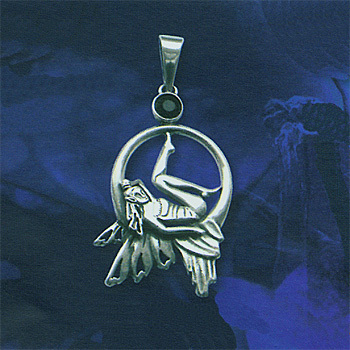 This pendant is made of Sterling Silver embellished with one Swarovski crystal. Because of its high quality Sterling is the most frequently used and most popular silver for the production of jewelry. It is also called 925 Silver and consists of 92.5% silver and 7.5% other metals. Its name is derived from the Sterling coins that were used in Great Britain until 1920 and which consisted of exactly the same silver alloy. This piece of jewelry aditionally was embellished with one prominent Swarovski crystal in a miracle setting. For the given surcharge this jewelry can be manually gilded by our skilled gilder - please be aware that an extra time of 3-5 working days is needed for this service before shipping. For the given surcharge we furthermore also offer this piece of jewelry in partial gilding: Please state in the corresponding text box which parts of the jewelry shall be ennobled by our gilder and which are to be left untreated - an extra time of 5-7 working days is needed for this service. This jewelry is part of the jewelry line up "Fairy Magick". Page: According to old belief the moonlight fairy helps in reaching prosperity and joy.